Two years ago, Sarah Racine of Traverse City was stuck in a rut. Had three kids, a job, a house, a husband, and not a lot of oomph at the end of the day. 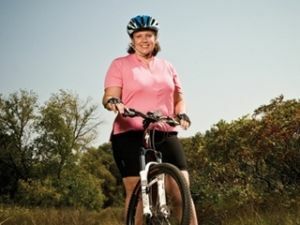 Her hubby, a road-biking junkie, pestered her to try mountain biking with the Cherry Capital Cycling Club. “I was pretty sure I’d hate it,” she says. “Actually, no. I was very sure.” Now, Sarah is hooked and a great source for why it’s easy to take up biking and why you should. Describe that first ride. Scary. Oh, God yes. I hadn’t ridden a bike in years. I couldn’t take my eyes off the front tire. But eventually I started to look down the trail. By the end of my first ride I wasn’t terrified anymore. By the end of the second I was relaxed, looking around a bit more. By midsummer I was, Woo hoooo! Woo hoo? It’s such a huge adrenaline rush. When you’re going down those trails and around corners—I descend down hills at breakneck speed. And then as you get more into it and your stamina builds, you can go longer. I start at three miles and build up to ten by the end of summer. What’s the toughest challenge? There’s definitely a mental component. You have to get over the fact that trees are right there in front of your face. Cars and people? They’ll move. Trees don’t care. Buy the Learn It, Love It Issue and get Learn to Climb and to Surf as well! Just click on the article photo to buy! Best trail for first-timers? The VASA singletrack. It’s a great place to start. The Kinglette is a 3-mile loop, relatively flat and smooth, but you’ve still got some nice climbs and drops. You’re still going to be sucking air like a fish. Advice for newbies? Make sure your equipment is in good working order. Always have a helmet. And don’t feel you have to keep up with the group. In the Cycling Club especially, there’s always a group that will go at your pace. I’m usually in that group. Any racing plans? Last year I competed in the [11-mile] Peak to Peak at Crystal Mountain in the beginner class. I did all right on the flats, but at the end, the last whole mile was up and down and steep-steep. I had mechanical problems, so I had to get off and walk that last mile. I was like, Well, I set the bar really low, so this shouldn’t be hard to beat next year. What’s your favorite part of mountain biking? The shower afterward. You’re all hot, sweaty, covered in dirt—and you’re washing off the trail. I always feel really good about myself, quickly followed by, Oh my God, I’m tired. Then I get into bed and I sleep really well. [The nights I ride] I get my best sleep. Credit for Sarah Racine’s confidence and balance on a bike goes in part to Jonathan Pool, avid T.C. cyclist and former national competitor of “Observed Trial” biking, where any obstacle is fair game for riding up, over and off. Every Tuesday night at 6 p.m., Pool leads Two Wheel Technique (aka Two-Wheel Tuesdays), an informal, free get-together where bikers work on their technical biking skills around Traverse City’s downtown: you’ll learn how to jump up and down curbs, roll over tree stumps, ride up and over three-foot rocks, bunny-hop down West Bay’s breakwall and more. Don’t believe you can? The “class” caters to newbies and boasts bikers from age 12 to 60 who once said the same thing. Prefer to start simpler? Pool offers several three-hour clinics throughout the riding season. Next clinics are July 8 and 11. E-mail tcbigadventures@gmail.com for Tuesday nights’ everchanging meet spot; see 2wheeltechnique.com for clinic details. There’s a whole world of outdoor stuff to learn and it is never too late to get started. The folks at these resources are in the business of helping you get your fee on the ground in a new adventure. Find the one that fits you and go do it! SLEEPING BEAR SURF & KAYAK, 231-326-9283, SBSURFANDKAYAK.COM.